All Woodland homes currently listed for sale in Woodland as of 04/22/2019 are shown below. You can change the search criteria at any time by pressing the 'Change Search' button below. If you have any questions or you would like more information about any Woodland homes for sale or other Woodland real estate, please contact us and one of our knowledgeable Woodland REALTORS® would be pleased to assist you. "This incredible estate, designed by award-winning architect, Fred Babock, includes a primary residence with seven bedrooms and a children's bunk room, a three bedroom Guest House, and an 5,000 square foot barn. Adjacent to the primary residence, is an outdoor pavilion featuring an enormous fireplace for outdoor entertaining. Enjoy serene views from the dock on a three-quarter acre pond on the sprawling estate, stocked with rainbow and brown trout. Wolf Creek Ranch is a private, 13,000 acre community just 20 minutes from Park City, featuring 60 miles of trails, private fishing on the Provo River and a 7-mile common boundary line with the 2.2-million acre Uintah National Forest. With jaw-dropping views, gorgeous architecture, and acreage to spare, this property is unrivaled anywhere in the Rocky Mountains." 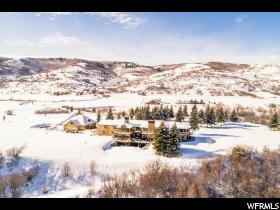 "Inspired by the Manor houses in Europe, River View Ranch is a sophisticated and luxurious retreat on 271 acres located only 30 minutes from Park City. Designed and built by the Mrs. Field's Cookies fortune and recently remodeled and renovated to enhance its original grandeur, this estate is a masterpiece of craftsmanship with exquisite stained glass windows, elegant woodworking, eleven dramatic fireplaces, stunning light fixtures, and numerous imported European accents. With ten bedrooms, including a magnificent master suite, and a large gourmet kitchen you can entertain in grand style: dine in the formal dining room where the woodwork was imported from Europe; sit in the formal living room anchored by a huge fireplace and look out at the riverbottoms below; relax in the great room where the walls and ceilings are intricately covered in stunning black walnut; retreat to the office where you will be inspired by the teak and walnut woodworking; or, move down to the basement where you can play pool, watch a movie, cozy up to the bar that was brought in from Scotland, or unwind in the sauna. When you are ready to play head outside where there are endless opportunities to have fun. For water sports there are two large ponds and over a mile of private access to the Provo River. You can saddle up in the 24 stall barn and ride in the arena or take off for hours riding around the ranch. 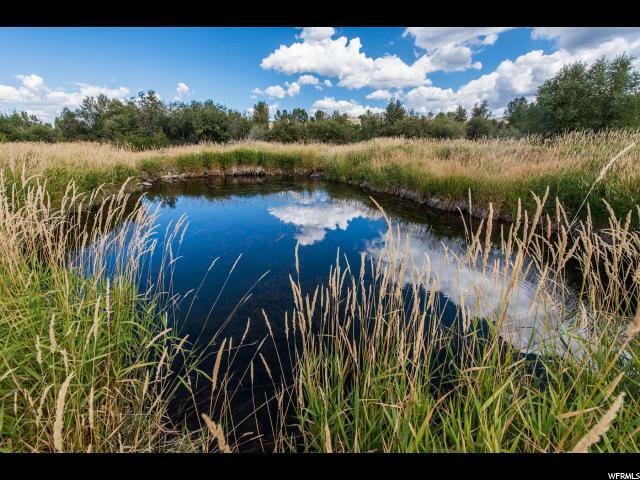 With extensive water rights and incredible privacy in an unmatched setting, this is a legacy property unlike anything else in Utah." "Gaze across your swimming pond at a view of Mt. Timpanogos or look back to the rugged peaks of the high Uintahs; you really can see it all from here. The estate features a 3,000 square foot guest home and a 6,000 square foot barn filled with amenities. Buyer shall pay a 2% Transfer Fee at closing. " "One of the first properties sold at Wolf Creek Ranch, Estate 46 was selected for it's privacy and views. The home and barn were then tucked just on the edge of a quaking aspen forest, creating a true western estate. The living spaces are properly sized and flexible for daily living as well as family gatherings, while the thoughtful floor plan allows multiple generations to enjoy the property at the same time. The perfectly sited home means the Great Room offers an unobstructed view across acres of mountain grasslands to the iconic Mt. Timpanogos. If you desire privacy, acreage and views, you have found your home. This property includes a home and barn. The home is 4,000 sf and the barn is 4,958 sf with living space above (2 bedrooms) for 1,620 sf. Total of home and barn includes 6 bedrooms, 7 bath and 2 half baths for a total of 5,620 sf." 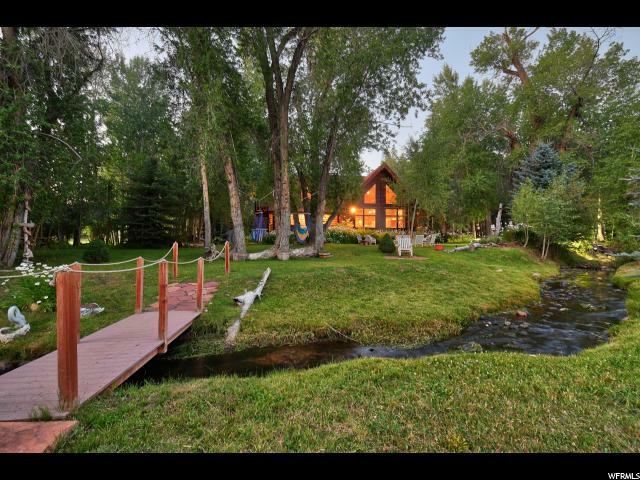 "Nestled on the Provo River, this beautiful custom lodge estate consists of 7 lush acres of property, and features a mixture of meadows, aspens, pines and walking or skiing paths. Only 25 minutes from PARK CITY SKI RESORT and an AMAZING SNOWMOBILING location! Two creeks split off from the Provo River and wind their way lazily through the property. Experience WORLD CLASS FLY FISHING year round.This rare retreat includes a spacious on-suite Master Bedroom with private deck, fireplace, elegant tub, and double shower. Exquisite details such as vaulted ceilings, copper detailing, alder cabinetry and a Chef AGA stove oven await the culinary elite. Guests can enjoy two separate bunkhouses facing the streams. Socialize by the fire pit, the large stone patio or in the uniquely built saloon. Many other GEMS throughout, such as a fishing pond, a volley ball court, horseshoe pits and a tea house for the little ones. This sanctuary is surely reflecting A LITTLE BIT OF HEAVEN FOR A LIFETIME LEGACY!" "Located within the gated community of Woodland Estates this outstanding property offers one of the most exceptional settings along the Upper Provo River and includes several large ponds, phenomenal landscaping, a three bedroom house, a two-car garage with workshop, and among many other features, spectacular views of the Kamas Valley. 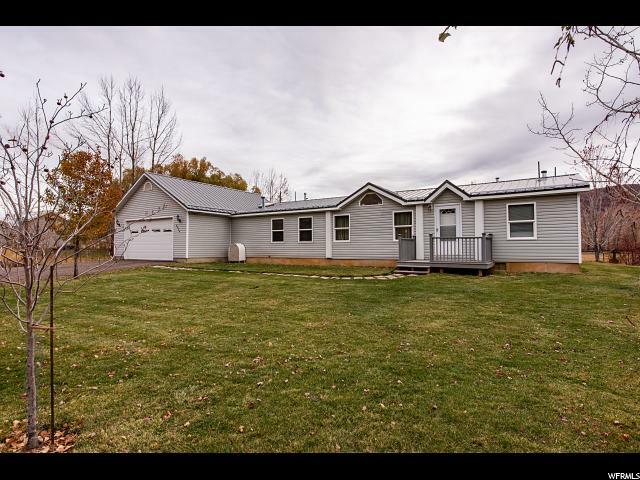 The flat and functional property is know for its amazing fishing but also offers a wonderful opportunity for horses"
"Don't miss this opportunity to own this charming country home on .63 acres of horse property in Woodland located in the Provo River bottoms east of Victory Ranch and Francis. There are 3 bedrooms, 2 bathrooms, vaulted ceilings and a 2-car oversized garage. Endless recreation just minutes from your door, everything from world class fishing, hiking, horseback riding, hunting, atv's and more. Located just 25 minutes from Park City and its many ski resorts and an easy commute of the entire Wasatch Front. Your will find horse corals and three out building structures and storage sheds. This home sits at the gateway into the Amazing Uinta Mountains where every outdoors-person dreams of hunting, fishing, snowmobiling, snowshoeing, hiking, biking and adventuring. Also, just moments away from lakes and ski resorts for the finest in skiing, boating, paddle boarding, kayaking, and everything else imaginable. Don't miss out on a rare opportunity to live your dreams, own this property today!"